The tougher the adventure, the more careful the choice of the gear to face it. Helmets are fundamental for your safety, but they must have a series of virtues other than adequate protection. These include maximum comfort, excellent ventilation and the ability to adapt to different circumstances and conditions. XENDA has all this, which makes it your perfect companion. Large upper area to mount helmet camera. Front visor with continuous adjustment. M4 W-Precision rear fitting system with three-position tilt angle adjustment at the back. Pads with anti-insect mesh. Spare set of pads. Velcro strap to fasten goggles. Multi-piece shell which ensures greater safety on impact and protects the interior EPS from minor everyday impacts, resulting in a longer lifespan. Helmet including a double inner pad kit that gives light weight and ventilation plus a net to ward off insects for greater safety and comfort. Helmet rear fitting wheel mechanism that is extremely safe, comfortable and light..
Have used Spiuk helmets for a number of years. They are great quality and have premium brand style and fit. They're also have a smaller shape than others so you don't look like a mushroom from Super Mario Brothers. When one comes along at a bargain price like this one did, I'm always tempted to snap one up. Good looking and nice. The visor was a bit thin to fasten a headlamp on, but worked out with some extra support. Was a bit tight, but sufficent room even for my big head. Great fitting helmet, light and unnoticeable whilst wearing. Was a bit worried on buying without prior fitting, but am glad I did and at the offer price it's a steal. Definitely recommended. Plenty protection for the base of the skull and the forehead. Bought this helmet when on sale as an impulse purchase as it matched my Fuse Pro and it looked fairly decent coverage wise. Initial impressions after two rides are that it's a very good fit, has a decent securing mechanism and provides good back of head protection. Both days I've ridden in it the temperature have been in excess of 20 degrees, and I've found it quite warm when the going gets slow (severe uphills). Once rolling it's fine, but if you want a highly ventilated helmet maybe look elsewhere. Feels very solid and like the design, so on the whole pretty good. A good fitting, light but well vented helmet. Good visor adjustment with a bladed screwdriver. Looks good too. I was looking for a trail-style helmet offering decent coverage around the back of the head while being reasonably breathable. The Spiuk Xenda has fit the bill well so far. 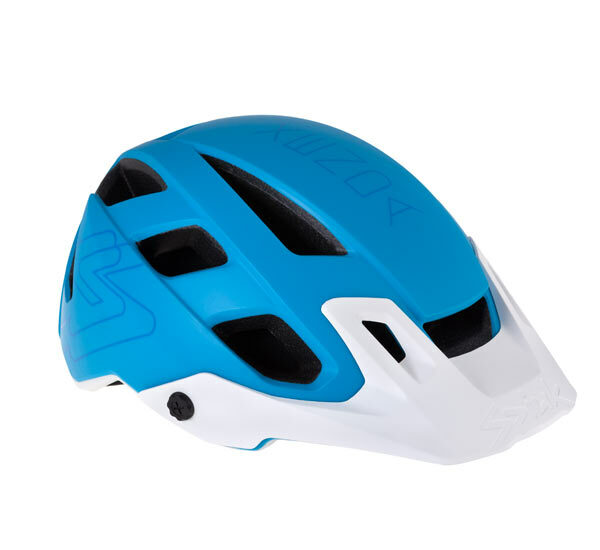 The fit is easy to adjust, comfortable for longer rides, and secure on the head. The helmet is well ventilated, and I've had no problems with overheating so far. The helmet comes with replacement pads as you'd expect, and also a nice neck-protector pad on the strap. Unfortunately the latter was a bit oversized for me once I'd adjusted the strap to my neck -- you could probably cut the pad down if you cared to; I just left it off. The black/yellow colourway is reasonably understated, and while there is an element of the "mushroom effect" for a smaller head with the one-size-fits-all sizing it's not too bad and the helmet looks good overall. The Xenda seems a good quality helmet, I'm very happy with it, especially at the discounted price from Merlin.